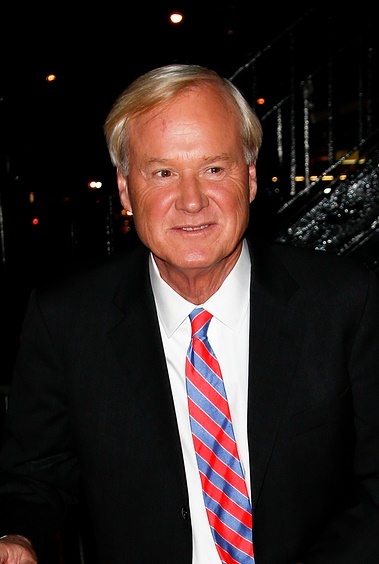 Chris Matthews is an American political commentator, television personality, and author. He has hosted the show Hardball with Chris Matthews since 1999, and previously from 1994 to 1996, and 1997 to 1999. He also hosted The Chris Matthews Show from 2002 to 2013. Chris’s paternal grandfather was Robert Bruce Matthews (the son of Edward Matthews and Alice Henderson). Robert was born in Devonshire, England. Edward was born in Coryton, the son of Henry Matthews and Jane Cuming. Alice was born in London, the daughter of Robert Bruce Henderson, who was Scottish, from Dumfries, and of Augusta Feather, who was English. Chris’s paternal grandmother was Matilda Jane Gardner (the daughter of John Gilmore and Jane Gardner). Matilda was born in Balleymoney, Antrim, North Ireland. John was the son of Lyle Gardner and Ann Neill. Chris’s maternal grandparents were Charles Patrick Shields and Mary Veronica Conroy (the daughter of Daniel Conroy and Mary Quinlan). Charles was born in Pennsylvania, of Irish descent. Chris’s grandmother Mary Veronica was born in Pennsylvania, to Irish parents.